HARRISON, Ohio -- Lacey Sowders waited in the Kmart parking lot on Harrison Avenue Monday afternoon while her parents, Shawn and Misty Sowders, shopped inside for the essentials. Like her parents, Lacey struggled to comprehend how a house fire 48 hours earlier had changed the family forever. "It's hard dealing with the fact that you lost everything," Shawn said. An electrical fire Saturday destroyed nearly everything in the log cabin home that had stood for more than 100 years in Whitewater Township, about a 10-minute drive from Harrison High School. 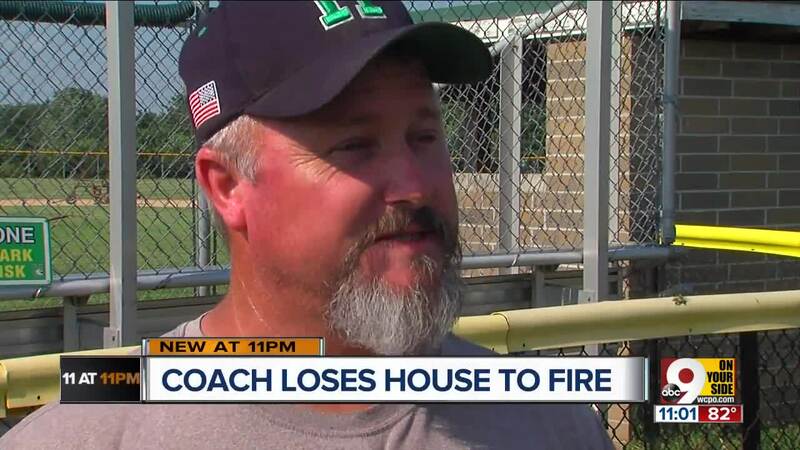 Shawn, a longtime Harrison High School baseball coach and Misty, a Harrison Junior School secretary, and their two daughters, Lacey and Josie, were not at the home. However, the family lost their two dogs. "That is just killing everyone the most," Lacey said. Eight different fire departments helped put out the blaze, according to the family. Some students and parents of former students helped at the site. Coaches and administrators have helped in any way possible. One firefighter put his uniform back on to help retrieve a bin that included Shawn and Misty's wedding album along with photos of the Sowders' late son, Lincoln, who died during birth June 1, 1993. "Oh my gosh, you have no idea" how much that means to the family, Lacey said. Shawn and Misty are staying with his parents while the family tries to figure out its next steps. They're trying to take everything one day at a time. In the meantime, members of the community are dropping off cash and bags of clothes to help them make it through. "It's humbling for me and my family," Shawn said. "We like to give and do things for other people. In our time of need, everybody has really stepped up." Lacey spent most of Monday fielding calls and dealing with insurance while trying to help her parents cope with the new reality. "Honestly, this is probably my mechanism for how I am dealing with it," Lacey said. "I am dealing with all of the stuff so I don't have to deal with my emotions." Shawn, a 1985 Harrison graduate, has never lived more than three miles from the baseball field. He stood by it late Monday afternoon and explained how much the community has meant to him over the decades. He's never locked his doors. His connection to the community -- forged through decades of coaching baseball, basketball and football as well as teaching social studies -- goes without saying. Harrison is home. He's received emails, text messages and Facebook messages with support from around the community, including some from people he hasn't seen in a quarter-century. Four families have already offered their homes to his. The Gold Star Chili in Harrison has scheduled a fundraiser from open to close (10 a.m. to 10 p.m.) June 26 for the family. Twenty-five percent of all coney sales will be donated to the family. Harrison Athletic Director Mark Meibers said the school is considering a car wash sometime soon. He also said Skyline Chili and the Cincinnati Reds are among other organizations showing interest in helping the family. "My dad has never asked anyone to give him anything in his entire life," Lacey said. "Taking all the support and all of the donations is very, very overwhelming for him." A Go Fund Me account started Sunday and raised $4,400 in six hours. By late Monday afternoon, the campaign had $14,276 after initially stating a goal of $5,000. There is also a donation account set up through Fifth Third Bank. The account is titled: "For the benefit of Shawn and Misty Sowders." Meibers said Monday morning the community leapt to action in a variety of ways. Area churches have collected food and toiletries. The athletic department is planning for car washes and bake sales to help the family. Meibers said Shawn Sowders has always been a coach who is willing to arrive early in the morning and leave late at night for the benefit of the school and its student-athletes. "He has tremendous value to the district," Meibers said. "He bleeds green." La Salle baseball coach Greg Leurck, a Harrison resident, said the Southwest Ohio Baseball Coaches Association will be making a donation to the Sowders family. "Shawn is a good guy," Leurck said. "Getting to know him as a coach and going against him -- it's always fun. Shawn Sowders said he doesn't know the next steps for his family. He's still processing what happened this past weekend. The next steps will happen soon enough. "I've lived here my entire life for a reason and this is the reason," he said. "When people are in need here, everybody steps up. Words can't express the gratitude."